Today’s plan: take Emerson to see her first, proper show in the West End. 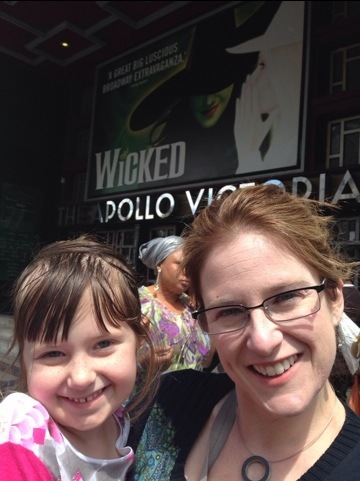 We explored our options online as concluded that our best choice (really only choice) for a kid-friendly matinee was Wicked, which Libby and I had both seen previously. To use our time most efficiently, we agreed to split up this morning with me heading to the TKTS booth in Leicester Square while Libby and Emerson went to the playground in Holland Park. I took the Tube to Tottenham Court Rd and walked down Charing Cross. I noticed that Foyle’s mega-bookstore moved to a new location (which can only be an improvement), but I didn’t stop in despite my strong desire to do so. I also passed by a Chipotle (second that we’ve seen), which seems like a good addition to London’s fast dining options (though I’m not sure how well it will go over with the Brits as Mexican remains fairly “exotic” compared to in the States). After securing our tickets, I returned via the Piccadilly Line and grabbed lunch for the girls on High St. Ken. In the early afternoon, we left for Wicked. How was the show? Meh… neither Libby nor I love Wicked. Despite its popularity, it has some issues. We also had understudies for both of the lead roles, though we actually thought the Elphaba was more interesting than the portrayal we saw in New York. In contrast, the Glinda was kind of weak and frankly a little too unattractive for the role. Emerson enjoyed it well enough and was perfect throughout, but I think she vacillated between bored (a sentiment I shared) and occasionally scared by some of the special effects. After nearly 1.5 hours (a long first act), we opted to leave at intermission because none of us really wanted to stay. On the way back to Allen House, we stopped in a new German bakery outside the High St. Ken. station. It’s called Kamps, and it’s very good. They actually serve Frikadeller in sandwich form, which–while a popular family dinner from my childhood–is a dish I’ve never seen “in the wild.” They also have amazingly good Cinnamon wuppies (buns), which are called a “zimt wuppie” in German and for which Kamps seems to be fairly well known in Germany. For dinner, we had decent yet relatively uninspired pizza from Pizza Express.